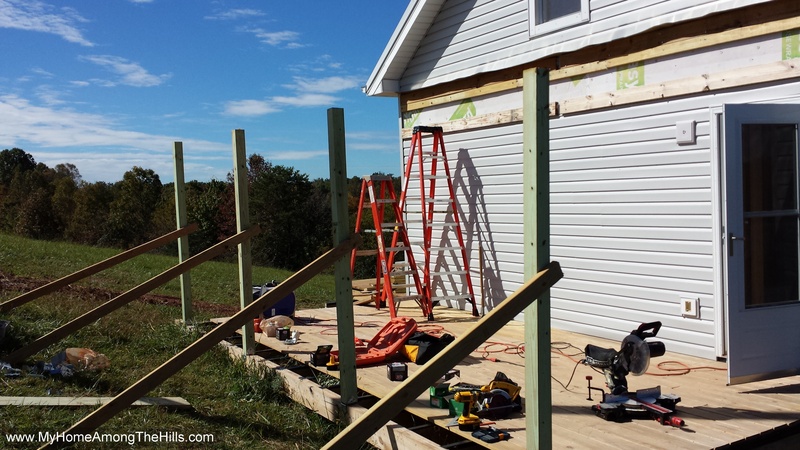 In addition to working on sorghum when my brother was here a couple of weeks ago, we worked some on the deluxe shed. If you ever looked at some of the old pics, you might have noticed the big space above the door where we didn’t put siding. 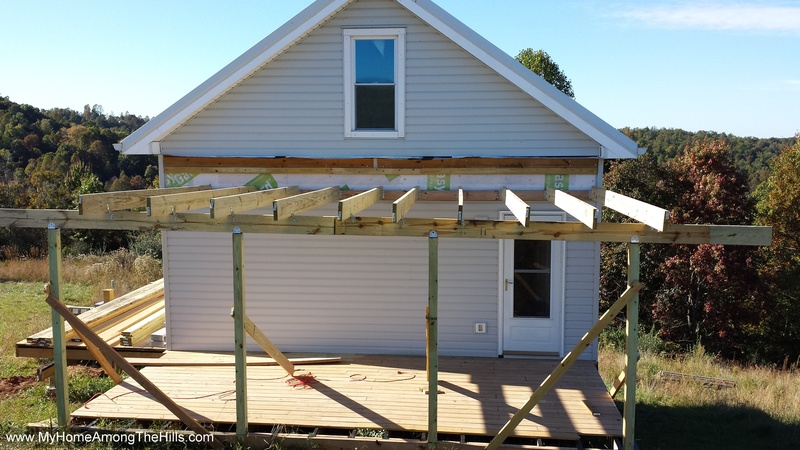 We left a gap where we planned to eventually tie in the porch roof to the house. That tie-in finally happened! 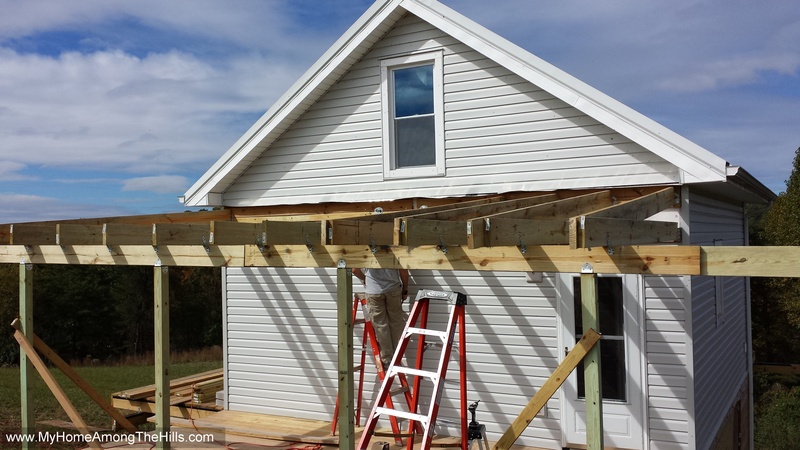 It took a tremendous amount of work, a lack of good sense and a little liquid courage but we raised a beam on which the roof rafters would rest. Once that was done, it was all down hill. I ended up buying 12′ long boards for the horizontal boards that came straight out from the house. 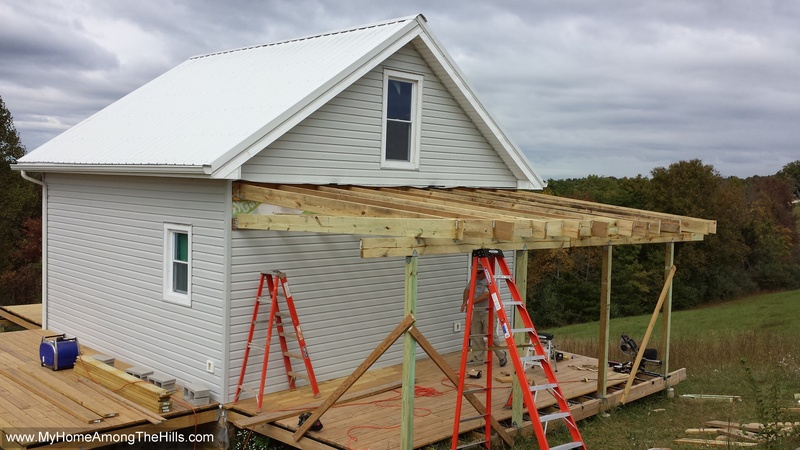 The angled boards that form the slope of the roof were 16′ long though I really only needed to span 14′. Unfortunately, our big box home improvement stores don’t sell 14′ boards. Anyhow, all of that is to say, we got big boards and they were heavy so I am glad my brother was here to help. I ended up getting treated lumber because I could find it (sometimes stuff is hard to find in a big box store…including helpers who know where all the things are located) and because it was only a few dollars more expensive overall. Treated lumber is almost always wet from the treatment process so weighs a lot more than typical boards. Did I mention stuff was heavy and that I was glad my brother was here to help? So, we got the basic frame up and, one of these days, we will add sheathing and tar paper and metal to finish this thing off. I am mostly excited because I think it makes sense why we left the gap in the siding now. I know people who live up by our place think I am crazy but at least this one weird thing now (hopefully) has an explanation! I just need to connect the decks and I think that will button up a lot of the remaining questions! Did you leave the extra two feet for a little extra overhand??? Looks nice. Good thing you decided to let your little brother live all of those years ago. Sounds like it’s paying off. GW – it’s all about the long term rewards…seems like I am finally getting some pay-off! This is jhawkins14’s dad. Several parents got prematurely grey during that tree house construction adventure he posted about!! They were working 30 to 40 feet up. His older brothers were the instigators of the project. We did require that they fashion a rope harness and tie themselves off to a limb while up there building. They used assistants on the ground to tie materials and tools to ropes for hauling them up. There was absolutely no adult help what so ever. I don’t recall that there was a single injury, not even a smashed finger. There are still a few boards and remnants up there, but alas the thievery continued with the subsequent generations of kids along the wooded creek. No telling how much recycling of tree forts has gone on. Wish I could find the pictures of it. It was a beauty to behold and was the talk of the neighborhood! I don’t know of a single adult who ever got the courage to climb up there. I don’t know how much longer the old tree is going to survive. Each year more and more roots get exposed from the creek eroding the bank. It’s leaning quite a bit now.